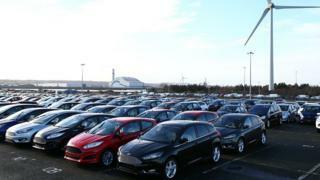 Growth in the UK’s economy has slowed as car sales fell and the manufacturing sector stalled, the Office for National Statistics (ONS) has said. The economy grew by 0.4% in the three months to October, slower than the 0.6% in the three months to September. “GDP growth slowed going into the autumn after a strong summer, with a softening in services sector growth mainly due to a fall in car sales,” said the ONS’s Rob Kent-Smith. Mr Kent-Smith, who is head of national accounts at the ONS, said there had been strong growth in IT and accountancy which had offset the fall in car sales. However, he added: “Manufacturing saw no growth at all in the latest three months, mainly due to a decline in the often-erratic pharmaceutical industry. The latest three-month growth figure follows a stronger-than-expected set of data for the three months to September, when the economy grew at its fastest pace since late 2016 buoyed by consumers spending in the warm weather. The wholesale and retail trade sectors – which had boosted GDP over the summer months – have now contracted and contributed a negative 0.2% to GDP. But there was growth in the services sector of 0.3% on the three-month rolling measure. GDP grew by 0.1% in October – after being flat in both September and August. In October, the first month of the last quarter of the year, the services sector was the only major part of the economy to expand. Industrial production fell 0.6%, with manufacturing output down 0.9%. Output in the construction industry fell 0.2%. Chris Williamson, chief business economist at IHS Markit, said the latest growth figures “come on the heels of more up-to-date survey evidence which suggests the economy is approaching stall speed and could even contract as we move into 2019 unless demand revives”. What has happened to the UK’s trade balance? In October, the UK imported more than it exported despite the weakness in the pound. The trade deficit widened to £3.1bn in October, the ONS said, as imports increased by £3.6bn, faster than the amount exported, which rose by £1.9bn. The ONS also revised the trade data for September, which now shows a deficit of £2.3bn compared with £0.1bn. “The widening in the UK’s trade deficit is a concern and reflects a sharp rise in goods imports,” said Suren Thiru, head of economics at the British Chambers of Commerce (BCC). What about the coming months? With October marking the start of the fourth quarter, economists said the economy’s progress in remaining months of the year could be determined by Brexit negotiations. Mr Williamson said: “The outlook for growth… very much depends on Brexit developments over the coming days, weeks and months, and the surrounding uncertainty makes forecasting extremely difficult. “However, what’s clearly evident is that the widely-expected slowing of the economy in the lead-up to the UK’s separation from the EU is now upon us, leaving the big question of whether the economy will bounce back alongside a smooth Brexit process or slide into decline,” he said. Yael Selfin, chief economist at KPMG UK, said that surveys of the services sector were also showing weak growth which do “not augur well” for the last quarter of the year.